CarsName, the Saudi Arabian car search portal offers a range of options to car lovers who intend to buy, sell or compare used cars online. We, at CarsName, take immense pride in connecting prospective buyers to genuine car sellers online. CarsName, the leading Saudi Arabian car search portal has now become a preferred online resource for car buyers intending to explore all options before zeroing in on the best of the lot. The online portal utilizes its search engine functionality to filter out redundant entries and provide quality results every time. Aside from utilizing CarsName for buying their dream cars, users may rely on this particular web portal to compare or sell their used cars. The car portal, thus, projects itself as a reliable resource for users who cannot afford to settle down on just any car, and, as such, want to do comprehensive research prior to their purchase. CarsName aims to make car buying an undemanding affair for customers who don’t know much about the car marketplace yet want to lay their hands on the best used cars up for their perusal. Aside from allowing car buyers to purchase their dream cars online, the web portal allows sellers to fetch the right price for their used vehicle. 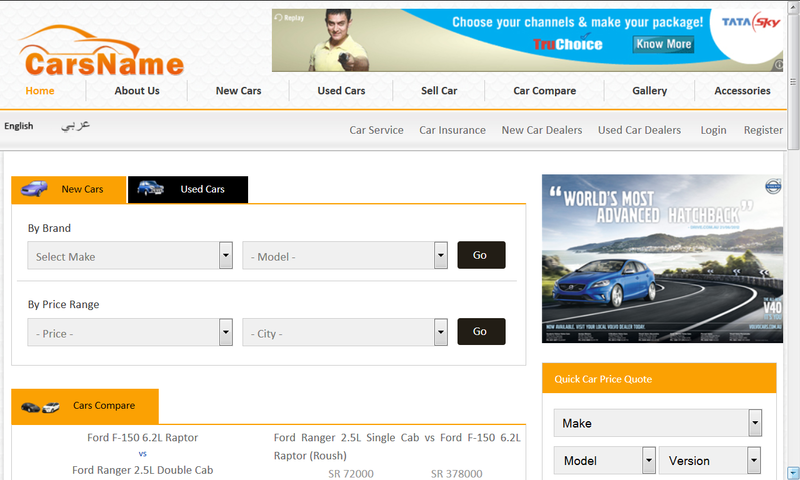 Car sellers can list their cars online on CarsName with unparalleled ease. For doing so, what they simply need to do is upload the photos of car under consideration and provide information about that particular car. When a prospective car buyers uses the search functionality, he can trim down his search results to the most apt ones by utilizing correct keywords. CarsName, in no time, has become a leading player in its niche segment and accordingly, provides quality car search services to its users from the Kingdom of Saudi Arabia. Therefore, those looking for car dealers in Saudi Arabia rely on CarsName’s expertise and years of experience to get their preferred cars online. The car search portal lists several Toyota cars in Saudi Arabia price at its website to make it easy for avid Toyota fans to buy the best “used” Toyota cars. CarsName, the leading Saudi Arabian car search portal is doing considerably well in helping Saudi car fans buy and sell used cars in KSA. The web portal flaunts quality search engine functionalities to ensure that users looking forward to buy used cars in KSA get the best cars online.